Giant Gloop uses Iceberg on the party in Fort Dragonia. Description Hails large chunks of ice down on enemies. Inflicts Frozen. 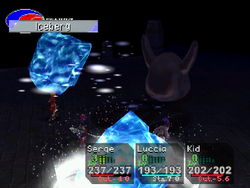 Iceberg is a 6th-level Blue Element in Chrono Cross. Traps for Iceberg can be purchased from the Demi-human merchant in Marbule (for 400 G) after Serge rescues the S.S. Invincible from the Ghost Ship and its legions of undead sailors. A free Iceberg can be found in Fort Dragonia if the player fails to successfully Trap it from the Giant Gloop, which casts it as a 6th level Element. JellyBlubba have this Element, which can be Pilfered or Snatched on rare occasions. Additionally, Scorpoid, found in abundance on barren wastes of Water Dragon Isle in Another World, cast Iceberg as level 7 Elements (Iceberg +1) and can be trapped there as well, should the player fail to Trap the Giant Gloop's Element or miss the freely acquired one. It should be noted, however, that Scorpoids rarely accumulate enough Stamina levels to cast Iceberg, making Trapping difficult. A dark aura covers the screen in shadows as a blizzard rages. Several streaks of fast-falling snow, horizontally pummels the party, calling giant chunks of ice from the sky to fall on all targets. Once they crash, several icy shards shoot into the air, followed by powder-puffs of snow. Afflicted targets glow red from the arctic temperatures. Icebergs are massive chucks of ice that form in oceans and other bodies of water. Only 10% of their actual mass is viewable from the surface of the water, leaving 90% of its gargantuan anatomy submerged beneath dark waves. This page was last edited on 31 July 2011, at 22:52.